It seems like only yesterday that I had the privilege of reviewing the debut album, ('Wrong Things Right') from this Antipodean four-piece (issue #65). The bottom line of that review basically described the album as "a solid foundation from which to build from". Now, just twelve months on we have their sophomore offering 'Heaven Or Heartbreak' bestowed upon us. It flaunts an impressive piece of front artwork that has an immediate visual impact which screams out, "Buy! Buy! Buy!" But, has it got the music to match? The first noticeable difference when "play" is pressed is that Jason Old (vocals, guitars), Steve Janevski (guitars, vocals), Robbie Erdmanis (bass, vocals) and Ben Wignall (drums, keys and vocals) have upped the ante in substantial fashion. Yes, the luscious four-part harmonies are still rampant throughout, and Janevski's dexterous guitar skills shine as bright as ever; but there now appears to be a greater maturity and depth in both the musicianship and song-writing departments. The punchy Power Pop embellishments of the debut album (an understandable influence from their Square One days) have dissipated somewhat and in their place there breathes a tighter, heavier sound with carefully crafted lyrical content. It's no secret that the band have an affiliation with, and have had expert guidance from Paul Laine (Shugaazer, Danger Danger, Darkhorse, solo), and on 'Heaven Or Heartbreak' his continued input is irrefutable; more so than the debut. Once again Laine has mixed the album; he's co-written three songs and shares the lead vocals on 'Science Fiction Make Believe', a song that has a dark underpinning DD – 'The Return Of The Great Gildersleeves' – type riff that blossoms into a typical TRS chorus, oozing harmony and melody. These sonic traits are palpable throughout the entire album. 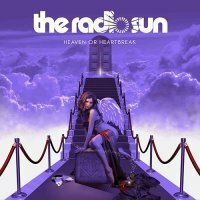 But it's the impressive 'Caught Between Heaven And A Heartbreak' that commences the opus, and in some style too; Old's inimitable and melancholic vocal delivery might not be to everyone's tastes (mine included...initially), but his vocals now embody the The Radio Sun sound just as much as Janevski's blistering guitar. The Pop Rock genre is still represented, with 'Tell Me What You Want', 'Hanging By A Thread' and 'Madness In The World' all displaying catchy commerciality. But it's songs like 'Do You Remember Me', 'Walk Away' and my personal favourite 'Maybe' that highlight the bands progression into Melodic Rock adulthood. I must also mention, 'Dying Without Your Love' and 'One In A Million'; a couple of slow-tempo, lighters-in-the-air (or should that be mobile phones) songs that certainly warrant their inclusion. Is the album heaven or heartbreak? Well, after numerous spins I'm happy to report it's certainly knocking vociferously on those Pearly Gates. A definite grower!